Description: This is the last Aurora Winter Train of the season, weekly NB, Anchorage to Fairbanks on Saturday (pictured) and return on Sunday. In the summer it is a long train daily with cruise ship cars and ARR super domes. Description: The Denali Express (DEX) is run north and southbound between Whittier and Denali Park each summer Saturday and Monday for Princes Lines. Its head light on low and ditch lights off for the meet. Picture taken from the SB Hurricane Turn. Note how far back the signal base is so not to impede snow plowing. Description: The Denali Express (DEX) is run north and southbound between Whittier and Denali Park each summer Saturday and Monday for Princes Lines. Description: 4320 has the MEX (McKinley Express) which is operated by ARR for Princess Lines in the summer Whittier to Princess's Lodge near Talkeetna and return each Saturday and Monday. The train is based in Seward. 4321 has ARRs Coastal Classic which runs in the summer daily Anchorage to Seward in the morning and returns in the afternoon. This is the northbound returning to Anchorage. Description: ARRs Coastal Classic runs in the summer daily Anchorage to Seward in the morning and returns in the afternoon. This is the northbound returning to Anchorage. Description: At 9:45 p.m. and it is still an hour and a half to sunset. 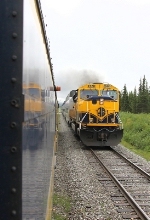 Alaska RR's Coastal Classic runs daily in the summer Anchorage to Seward in the morning and returns in the evening. This is the returning northbound threading the shores of the Turnagain Arm of Cook Inlet returning to Anchorage. Description: About 45 minutes from Anchorage Depot July 13, 2009 at 9:45 p.m. and it is still an hour and a half to sunset. Alaska RR's Coastal Classic runs daily in the summer Anchorage to Seward in the morning and returns in the evening. This is the returning northbound threading the shores of the Turnagain Arm of Cook Inlet returning to Anchorage. Up front is 4321, a SD70MAC and generator car P-30 built from an E9B. The SD70MAC is a straight freight engine so P-30 provides head-end power (HEP).